When Al Cazino Hotel Latakia speak about Lattakia, the bride of the Syrian coast, Al Cazino Hotel Latakia must recall Alcazino Hotel and Restaurant as a distinctive historical, touristic and modern feature in Lattakia which was the a tourist aim for all the guests, Syrian, Arabs, and foreigners. The new management of Alcasion to put a distinctive trace in its tourist record by providing all the services, comfort, entertainment to leave the best memories in the minds of its customers..In order to serve the business men, and to keep them in touch with the world and theor business, Al Cazino Hotel Latakia provided the hotel with all kinds of communications such as internet, e-mail, and telephone lines. There are also receivers for TV satellite transmission in all the rooms and lounges of the hotel, which look up the sea, the port and the beautiful corniche of Lattakia. 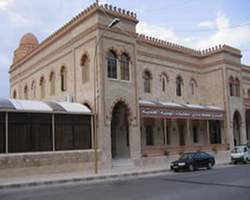 The management is pleased to put its distinctive halls which are furnished with all the needs of your happy occasions, takes your to the atmospheres of classical, traditional and modern music and singing in a homelike evening parties, full of the most delicious oriental and western various meals. Al Cazino Hotel Latakia would be very delighted when you visit us. Al Cazino Hotel Latakia is ready to hear from you, and willing to receive all your notes to get all that satisfy your wishes. The rooms are distributed in the two story building with astounding architectural design with a beautiful lobby in every story as a witness of the artistic touch for this old fashioned French building. 14 double rooms (two beds). 3 triple rooms (three beds). 7 lounges furnished for visitors, business men and VIPs. At the west side: The sea and the harbor. At the east side: Lattakia city. At the North: The north corniche. At the South: The Baterny (Al-Mencheih) Park. There is a laundry for washing and ironing within the building of the Al Cazino hotel for the visitors. There are many shops to fulfill the different needs of the tourists. The Al Cazino hotel has a special electric alternator, and an additional electric generator (diesel). A TV. with Satellite channels. The kitchen serves all kinds of foods and the western, oriental and traditional meals. With complete readiness to provide the outdoor meals for different occasions. It can accommodate 600 chairs, its is furnished with best modern equipments, big TV screens, full air conditioning, excellent service and fascinating scope of view. The hall is supplemented by a small area for the toys of children. There are weekly musical and dancing programs, and parties for the best Arab singers. Assigned for small conferences and birthday parties of the children and various exhibitions. Al Cazino Hotel is also ready to receive the Arabic and foreign tourists groups with best accommodations, and to make the parties at any time all the year round. Al Cazino Hotel has special offers for the tourism offices via the general relations office and the Assembly of management, personally or by correspondences. It has all the acoustic and visual equipments necessary to serve the wedding ceremonies, and the descotic parties. A special hall for entertainment and educational meetings. It can host all the scientific educational, economic activities and the discussion and friendly meetings. The Summer terrace at the east side of the hotel. A terrace in the second floor looks down the harbor and the sea at the west side.